NEWS — . . .
Bid on AFTER ALL, LIVE AUCTION LOT 327, to help benefit the Crocker Art museum! If you are unable to attend, click on the HERE link for more information. This artful evening features works by more than 100 of the region's finest artists, silent auctions followed by a gourmet dinner, and an exciting live auction(where my paintinmg will be one of the featured works.) Casually elegant attire. Please join me for a lecture on my work, followed by a reception on February 2, 2017 at the Shasta College Art Gallery. Presented by the Shasta College Division of Arts, Communications & Social Science and the Shasta College Foundation. Headlands Bldg. 828 EXP-0038 will be LOT 14 in this years benefit auction for SF CAMERAWORK. See info below. Founded in 1974, SF Camerawork’s mission is to encourage and support emerging artists to explore new directions and ideas in the photographic arts. Through exhibitions, publications, and educational programs, we strive to create an engaging platform for artistic exploration as well as community involvement and inquiry. Unable to attend? Place an absentee bid! Galapagos Series mini-zine. Come out and grab an 8 page mini-zine I produced from the Galapagos Series I've been working on since arriving at Headlands. Limited Edition of 50. Come out to Headlands for the Fall Open House, Sunday October 16, noon-5pm. My studio is in Building 960, #17. Very nice review of my solo show "The Silence AroundYou" at the Ruth Bachofner Gallery by LA Times art critic Leah Ollman. Please click on the link here to read it in its entirety. I'm pleased to announce my first show of photographic works. Join me at EUQINOMprojects on July 29 for a group show including Oliver Leach, Daniel Postaer, and Gabrielle Teschner. Come out to Headlands for the Summer Open House, Sunday July 17, noon-5pm. My studio is in Building 960, #17. I'm happy to announce that I will be returning to Headlands for a second year as an affiliate artist. The experience so far has been engaging and opened my practice to many new ideas and artists. I look forward to another year of art, beautiful views and some truly delicious artist meals provided by the talented chef staff! With that, I'm excited as well to have been asked to participate in this years Headlands benefit auction. My painting "Ditto(Grey)" will be a part of the silent auction. See info below if you'd like to place a bid via paddle8, or better yet buy a ticket and attend the event. Come out to Headlands for the Fall Open House, Sunday October 25, noon-5pm. My studio is in Building 960, #17. I'll have paintings as well as new photography experiments. Stop by and say hi. Experimental studies: photo and charcoal on newsprint. Come out to Headlands for the Summer Open House, Sunday July 26, noon-5pm. My studio is in Building 960, #17. Stop by and see what's happening. I am very excited to have been selected for the 2015 Affiliate Program at the Headlands Center for the Arts in Sausalito, California. After twelve years of working out of my West Oakland studio, I'll be closing shop and moving out to the Headlands starting July 1, 2015. Stay tuned for more updates. Very excited to come back from vacation to find my shipment of New American Paintings #115 had arrived. I was one of 40 artists chosen for the Pacific Coast regional issue by juror Apsara DiQuinzio, curator of Modern and Contemporary Art and Phyllis C. Wattis Matix curator at the UC Berkeley Art Museum. She writes in her comments: "Let us also consider another important period in painting's history, that of the Italian Renaissance, what some may still think of as the pinnacle of western painting, known for its development of central perspective within a single compositional frame. The artist Gary Edward Blum utilizes this classical notion of perspective in his painting "The Nimrud Lens," that sets a painting within a painting, with the lines of the floor in the foreground continuing in the painting shown hanging on the wall. If Renaissance painting was about developing a concept of space within the canvas, painting today might be about examining the space around and outside of the canvas in addition to what is delimited inside." Grab a copy in newstands everywhere. Bid on PAINTING FOR SYLVIA, to help benefit the Crocker Art museum! If you are unable to attend, click on the "bid" link for more information. This artful evening features works by more than 100 of the region's finest artists, silent auctions followed by a gourmet dinner, and an exciting live auction(where my paintinmg will be one of the featured works.) Casually elegant attire. Bid on SOLITUDE, to help benefit the Crocker Art Museum! If you are unable to attend, click on the link above for more information and/or fill out the absentee bid form. The exhibition ABSTRACT VISIONS is meant to celebrate the centennial of abstract painting. Abstract art has evolved from its original spiritual and utopian stance in the early 20th century to its present vibrant position. Refuting the digital display of the current moment, abstract paintings are simply pictures, brushed by the hand of the artist, in which emotional intuition is framed by the artist's rational mind into dynamic metaphors. Naomie Kremer's energetic abstract paintings allude to forest interiors and Donna Brookman's evocative Ragini Paintings also respond pictorially to the natural environment as do the stunning new paintings by Eva Bovenzi. Kevan Jenson creates visual magic with the use of smoke. Gary Edward Blum's acrylics which at first glace appear to be pure abstractions surprise the viewer with their trompe l'oeil details, just as Gloria Tanchelev's square canvases reveal glowing layers beneath their smooth surfaces. Bruce Hassan's organically encrusted bronzes are ingeniously named after the volcanoes on the earth's six continents. I am pleased to assemble this extraordinary group of Bay Area artists for ABSTRACT VISIONS at Berkeley Art Center and thank director Suzanne Tan for assisting me with the selection process. 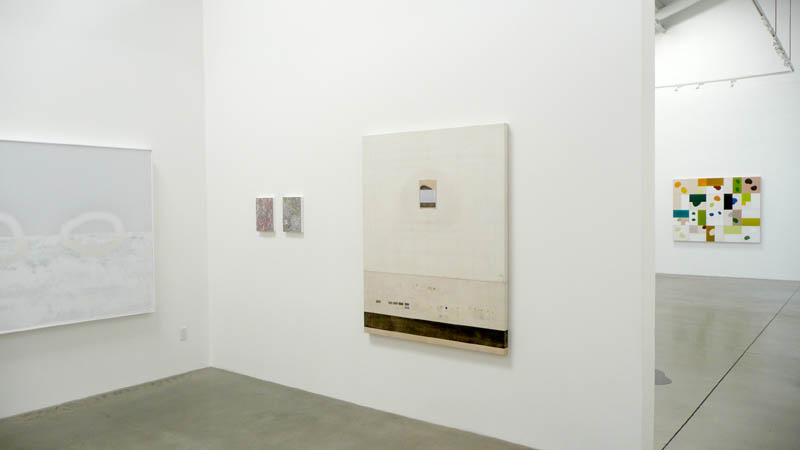 A ten day exhibition of works by a select group of contemporary artists currently working in California culminating in a dynamic Gala Auction on April 30, 2011. Abstract form always existed. Prehistoric cave art, ancient art, medieval art and modern art used abstraction right alongside stunning verisimilitude in smart, deliberate ways. Western cultures equated the ability to duplicate the world with the highest standard of art skill, until the camera. Machines that in a click captured the real—as well as contact with artifacts of colonialism—led artists to re-imagine uses and meanings for abstraction: universal communication, theosophy, primal expression, the inner structure of objective reality, and to signify creative ‘free will’ in contrast to lock-step formulas of social realism. Art history attributes the first abstraction to Kandinsky’s Improvisation of 1911. Oddly enough, non figurative forms in that work repeat similar shapes in the oldest known caves in Marseilles—and these potent marks sit comfortably beside images of lions so real they rend the heart. It’s fitting that one hundred years later we reconsider what abstraction means today, its legacy and longevity, how and why it is used. More fitting still is that we do this through works and words of artists who deploy that language now, each in very different but ever viable ways. This exhibition, Framing Abstraction, is meant to celebrate the centennial of abstract painting. Abstract art has evolved from its original spiritual and utopian stance in the early 20th century to an art which was seen as radical-avant-garde, and on to its present vibrant position. Refuting the digital display of the current moment, abstract paintings are simply pictures, brushed by the hand of the artist, in which emotional intuition is framed by the artist’s rational mind into dynamic metaphors. In his show of new abstract paintings, Gary Edward Blum juggles modes of pictorial reality, creating productive tensions between flatness and depth, and intriguing interplays between fact and representation. He has a painterly feel for a color and surface as well as a gift for gamesmanship. Each of seven acrylics on canvas, ranging from 2 1/2 to 6 feet on a side, is accompanied by a small framed acrylic on paper study. Several of the paintings faithfully duplicate the studies, while some are variation on their themes. The canvases display a muted palette and rectangular blocks or bands of color, some of the works recalling the clarity of a John McLaughlin, while others are more Rothkoesque. All, though, feature an additional painting within the painting that replicates the composition on paper. These replicas seem to hang on the surface of the painting, trompe l’oeil fashion, complete with faux Scotch tape and painted shadows. In several works, such as A Rarely Loved Thing, the darker tones at the bottom seem to describe a floor, the lighter upper area a wall on which the replica of the study appears to hang. That “wall” is marked with a grid in subtle shades of off-white and light gray, recalling not only Agnes Martin but also the kind of grid artists use to scale up a study. Elsewhere, things are satisfyingly hazier. The study for Solitude is divided between fields of deep violet-black on the left and turquoise-aqua on the right. Departing from this composition, the painting introduces a faintly gridded off-white area at the left, which includes the replica of the study; the violet-black that dominates half the paper work is reduced to a central vertical strip that separates the off-white from an expanse of turquoise-aqua at right. In this work, no “floor” corresponds to the “wall” where the replica seemingly hangs, and thus there is less implication of an interior. Instead, Blum suggests a more expansive and ambiguous space, just as the painting’s divergence from the study indicates a freer, looser approach. Blum's companion pieces: Gary Edward Blum's work at Dolby Chadwick risks getting snarled in its own cleverness, but it presents viewers a healthy resistance. Healthy in the sense that, in a culture hooked on speed, it takes time to figure out and rewards inspection with a clear internal logic. 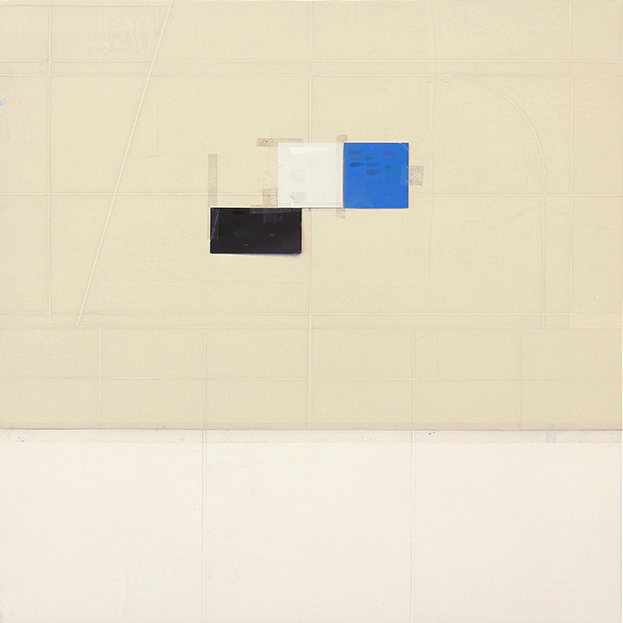 "Painting for Sylvia" (2010), a characteristic work in the series, consists of a small framed abstract "Study" that Blum has repainted - illustrated, really - as the kernel of a large unframed canvas. In the painting, the "Study" appears to hang on a wall, but then you notice that the wall repeats, magnified, the composition of the "Study" itself. In this toying with pictorial paradox, Blum may revisit territory explored by William Anastasi and Michael Snow - even by René Magritte (1898-1967) - decades ago, but a pervasive new postmodernist suspicion of representation has refreshed the exercise. The Crocker Art Museum has acquired its second piece, "The Long Year" for its permanent collection. Dolby Chadwick Gallery is pleased to announce the upcoming group show, The Art of Play. This has been a challenging year for artists and the institutions and business that support them. Our hope is to add some levity to the end of 2009. We feel a great deal of gratitude to have survived thus far and look forward to celebrating the end of the year with this exhibition focused on play. Listen to Molly Barnes and Jim Morphesis discuss the White Show this Sunday, March 29th. 88.5 FM at 7:30 p.m. to 8 p.m...You can also go to kcsn.org and listen to it live on your computer. "Seco Street" was chosen for the Spring 2009 edition.